Hello Loves! 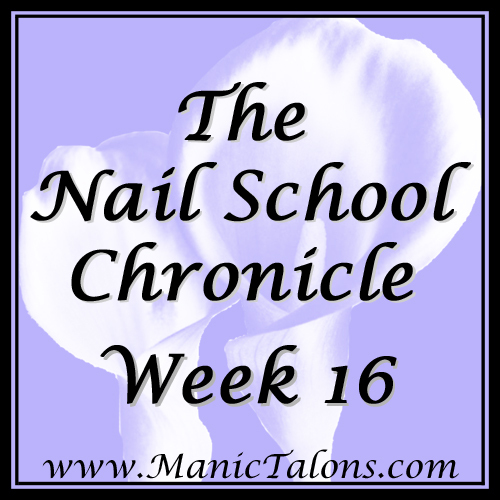 Another Monday is upon us, and you know what that means - another nail school update! Goodness...I'm not even sure where to start. We had another nail art contest...plus the usual repetition stuff...and oh yeah...Bob. Who is Bob? Well, you see...what happened was...we came in Monday morning to find a new addition to the nail area. Someone had placed a very sad looking tree beside the classroom door. When I say sad, I mean just lost your puppy sad. I didn't think to get a full picture of it (or any picture, really...but I borrowed one from Nicole). Anyway, this is a very sad tree with a serious gangster lean. You pretty much have two choices - turn it so that it leans out into the walkway or turn it so that it rests against the wall. Either way, we kept running into this danged tree as we tried to enter the classroom. So they moved it. Where did it end up? Right beside the nail station where I usually sit. After continuing to run into the freaking thing, I decided it needed a name. Bob. Yes, Bob. Why did I name it Bob? Because every time I left my station for any reason, I found myself having to bob and weave to keep from ending up with a tree in my face and Weave would be a really strange name for a tree. :) You might think I would learn after running into it the first time, but no. So Tuesday rolls around, and I'm still running into that stupid tree. 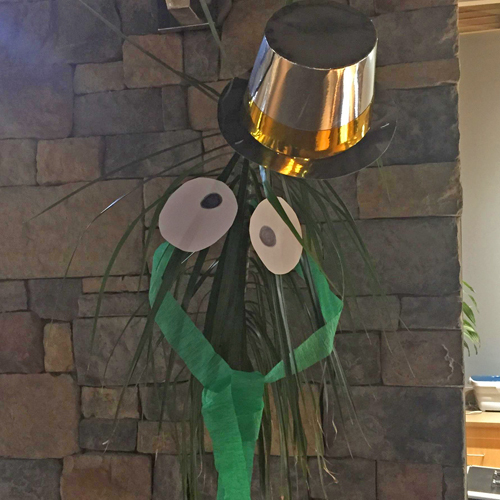 The entire building was decorated for St. Patrick's Day, so I decided Bob needed a little sprucing up too. With a little help from Nicole, Bob got a face lift...err...Bob got a face. lol Meet Bob. Would you believe I still ran into him even with the silly hat? Ok, moving on. I figured it's time for another then and now comparison on my acrylic work. I still hate acrylic, but I've been working on my sculpts using the reverse method. 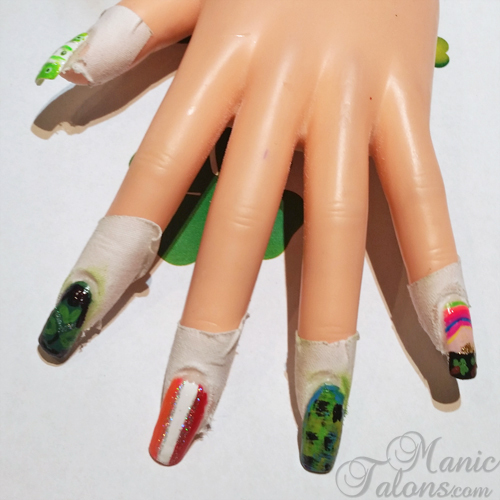 My instructor can usually look at a practice hand and immediately tell if we used tips or sculpted over forms. I took this hand to her and she asked if I used tips. Whoo Hoo! I take that as a HUGE compliment and an indication that my shaping on my sculpts has greatly improved. 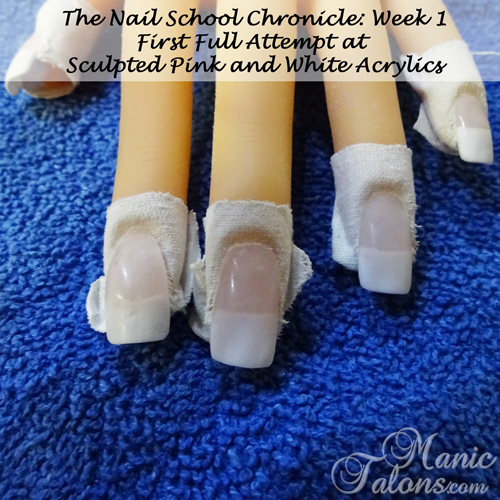 So, here they are - basic pink and white sculpted acrylic using the reverse method (reverse is where you shape the pink first, file the smile line, then sculpt the free edge in white over the form...standard method sculpts the tip first and then adds the pink). Given, they could use a little more buffing or a gel sealer, but I'm pretty pleased with them. 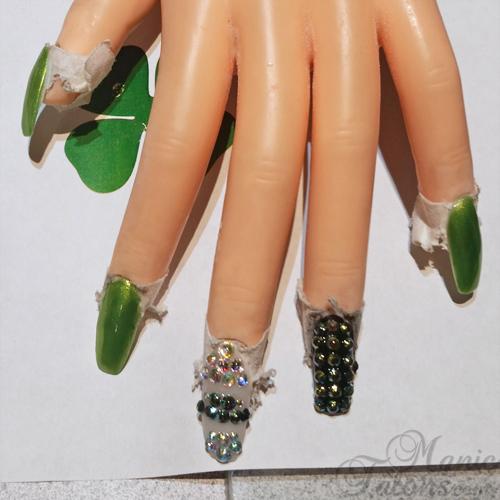 Finally, a set of nails I would actually pay for! 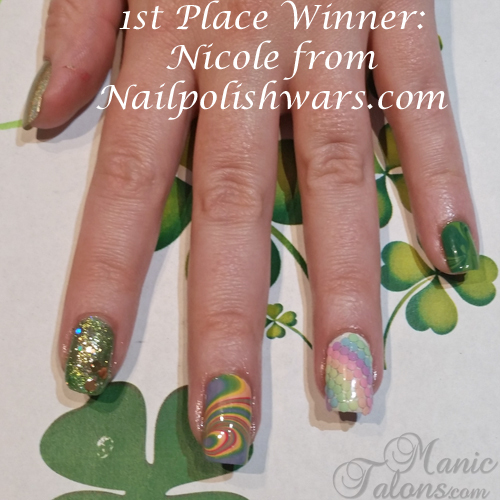 Moving on...the nail art contest this week was St. Patrick's Day themed. There were some really fun ideas in the competition. Want to see them? I can't remember who did what except for two of them. Sorry about that. If any of my classmates are reading, please let me know which hand is yours in the comments and I'll edit the post to give credit! I also didn't have much time to snap pictures and a few of them ended up a little blurry. Now for the ones I know: This one is mine (though I'm sure you could have guessed). 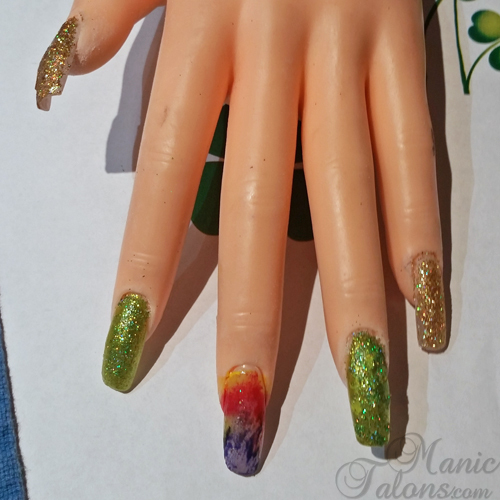 I don't know why, but I tend to use these nail art contests to try new things. Crazy, right? I mean, it would make more sense to stick with what I know and have mastered, but I've pretty much accepted that I'll always lose to Nicole anyway. Might as well try something new. lol For this one, I used tips and and my ArtsyFartsy Crafts glitters for an overlay. The middle finger has a few gold crystals, but the ring finger is my true pride and joy. That's an inlaid clover that I sculpted out of colored acrylic. I added a few crystals for accents, then encased the entire thing in clear acrylic so the surface of the nail is super smooth. 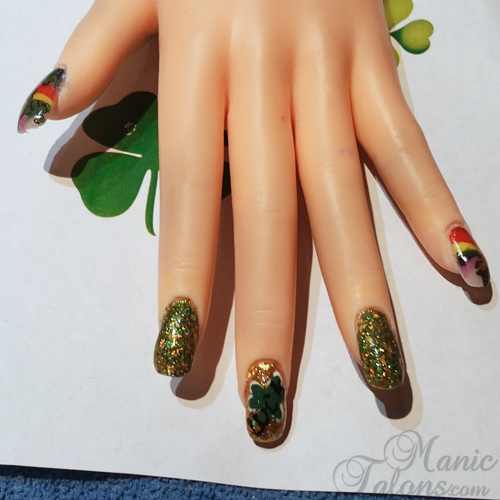 In hindsight, I should have added some accents to the clover with acrylic paint before encasing it with clear. Live and learn. This is the first time I've attempted an inlay, and I'm pleased with how it turned out. I was even more pleased when I saw the director of the school pick up my hand and run her fingers over the nails during the judging (judging was by instructors, staff, and students from other departments). Oh, and I won 2nd place. Here's an angle that shows the clover a little better. We'll see what happens for our next competition. It's an April Fools/Easter themed competition and it is bound to have some crazy aspects. Ms. Rhonda has already hinted that she has a few tricks up her sleeve. That's all for the school update. How about a little blog update? I know I promised last week that I would show you the BMC Sedona thermal collection. Yeah, it didn't happen. Y'all, I'm freaking exhausted. I had the swatches done, but I didn't get them edited in time to post on Friday. People often ask me how I do it - full time student, mother and blogger. The answer is simple...sometimes I don't. I usually swatch on the weekends - some Saturdays I don't even leave the house. Then I edit and write late at night throughout the week. I don't sleep much, and it catches up with me sometimes. Anyway, I did get those edited for this week. Since I'm dying to show you the Hawaiian Escape collection too, I decided to do a double feature. 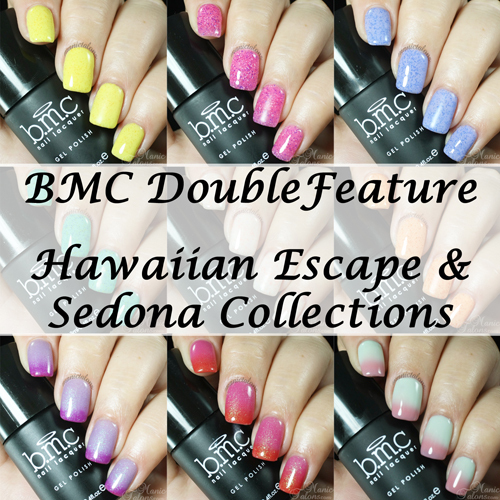 So check in Wednesday to see both the Hawaiian Escape AND Sedona Collections from Bundle Monster. And yes, the photos are already edited and I'm starting the writing part tonight so it really will go live on Wednesday morning. ;) Here's a little teaser. Wow, those acrylics are gorgeous Michelle - you've come a long way!! I'm pretty happy with my nails but you make me want a set of those - LOL!